Coal Harbour is bounded by Vancouver’s financial district to the South (to the Southeast by Burrard Street and to the Southwest by Georgia and Pender), and to the Northwest by Stanley Park. Coal Harbour is literally a ten minute walk from the corner of Georgia and Burrard. If you would like to take transit, the 250, 240 and 247 will all get you to the corner of Pender and Broughton within a few minutes. 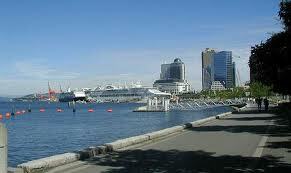 Coal Harbour is popular with young professionals and young families that reside in this area. Coal Harbour is a great place to take a stroll on a sunny day as there is easy access to the Stanley Park seawall. Take in the spectacular view of the North Shore mountains and check out the marina where there are a number of floating homes. It is considered one of Vancouver’s most luxurious and prestigious areas to live in. Pollination (1378 Georgia) – Charming floral design and gift store. Great place to pick up a unique and artistic floral bouquet or gift basket. Graphic design services also offered. Bark & Fitz (561 Cardero) – A pooch-inspired retail health food store offering natural and holistic food and treats, stylish gear, fun toys, gifts and more. Spoil your dog with something from their infamous in-store bakery, then leave him in the hands of their professional groomers for some serious TLC. High-quality natural products are available for our feline friends as well. Sabai Thai Spa (571 Cardero) – After taking a long walk along the seawall, treat yourself to a rejuvenating experience at Sabai Thai Spa. Choose from a large variety of services including facials, massages, manicures and/or pedicures, body exfoliation and more. The staff are friendly and very accommodating. Spa packages and memberships are also available. Blue Tree Cafe (551 Cardero) – This is definitely my favourite cafe to visit in the neighbourhood. Offering a variety of hearty soups, delicious sandwiches, breakfast items and European pastries. Serving coffee by Casa del Caffe and tea by T.
Cardero’s (1583 Coal Harbour Quay) – At Cardero’s, you will enjoy the best views the neighbourhood has to offer as the restaurant is literally located atop the waters of Coal Harbour marina. Of note is Mussel Mania, offered between Monday to Friday from 3-6pm in the Marine Pub – fresh mussels (ocean wise) and frites with a pint of Granville Island Brew for only $10! by a team of talented chefs. For the ultimate experience, go for the tasting menu – at $75 per person, with a minimum of two people, you will get an array of Asian inspired dishes that are prepared with fresh ingredients and executed with care. Preston’s Restaurant (1177 Pender) – Creative West Coast cuisine with a Mediterranean and Asian twist! To start, choose from a variety of small plates to share. Of note are the grilled calamari, the dungeness crab cakes, and the chowder. The interior is modern and the atmosphere is the staff are hospitable. Market by Jean-Georges (1115 Alberni, Level 3)- If you are seeking an elegant and contemporary dining experience, look no further! This Jean-Georges restaurant features seasonal, regional ingredients with an emphasis on fresh, local seafood. The restaurant offers four dining experiences – a private dining area (for groups of up to 40), a heated covered outdoor terrace with stunning city views, a bar, and a modern dining room that features two private rooms (one for groups of 10 and the other for 16). Breakfast, Sunday brunch, lunch and dinner are all available, and reservations are recommended. Coal Harbour is a very quiet neighbourhood in the evenings. However, from May 1st to October 15th, there is a Sunset Dinner Cruise. The 2.5 hour cruise offers spectacular views of the downtown skyline, the cruise ship terminal at Canada Place, the mountains behind the North Shore, the West Vancouver shoreline and more! Take in the sights while enjoying live music and a buffet featuring delicious West Coast cuisine. The cruise operates 7 nights a week and runs from 7-9:30pm (boarding is at 6pm). Westin Bayshore 1601 Bayshore Drive, is a popular hotel in a good location. It’s close to Stanley Park and to the seawall. Coast Coal Harbour 1180 West Hastings Street, is a fairly new modern hotel with a gym, outdoor lap pool and hot tub. Fairmont Pacific Rim 1038 Canada Place, is the newest of the 3 Fairmont Hotels in Vancouver, and it has a very contemporary hip feel to it. Marriott Pinnacle 1128 West Hastings Street, is close to the cruise ship terminal and the float plane terminal. Rennaissance Vancouver Harbourside 1133 West Hastings Street, is also close to the cruise ship terminal and the float plane terminal. Robson Suites 777 Bidwell Street, is an all-suites hotel close to Stanley Park and the nice walking area of Denman and Robson Streets. There is a good community centre: Coal Harbour Community Centre (480 Broughton) – Offering a variety of programs for all ages. Facilities include an ice rink, fitness facility, racquetball/squash courts, dance studio, indoor cycling studio, pottery studio, steam room and more. Rooms for rent are also available. The seawall is accessible and you can walk all the way over to Stanley Park in one direction, and towards False Creek in the other. It has one path for pedestrians, and the other for cyclists/rollerbladers. There is also a big park at Broughton and Hastings where many residents take their dogs to play.